Home Featured Politics RE: PRINCE EZE MADUMERE’S MANY REGRETS By Nathaniel Osuoji. RE: PRINCE EZE MADUMERE’S MANY REGRETS By Nathaniel Osuoji. I read a satanic verse authored against the ebullient Deputy Governor of Imo State, Prince Eze Madumere, by a frustrated renowned lootocrat and unfortunate Governor of Imo State, Rochas Okorocha through one of his mentally unstable aides by name, Onwuasoanya Jones. For the readers, I seek your permission to address Okorocha directly because he gave Onwuasoanya the approval to insult Madumere. I have waited for Madumere's Media handlers and nothing is coming forth. I feel that it would be wrong if Okorocha’s misrepresentation of facts about Madumere is not dealt with without further delay. The fact is that the best measure of any good leader is his ability to discern what good human resource is and how to build them into a formidable team that will be able to provide solutions to challenges. It is unfortunate that Okorocha rather than employ those that would help him succeed, in his timidity, would always employ unemployable intellectual midgets who are far worse than himself. This has been a huge deficit to him and the entire Imo people. Little Wonder since Prince sidestepped away from the whole arrangement nothing else has ever worked in Okorocha’s administration. Since then, we discovered that what ought to be a government turned into a highly organized criminal venture. Therefore, one is not surprised at the employment of two reckless ignoramus light Sam Onwuemeodo and his like, Onwuasoanya. The unfortunate coincidence is that the paternity of the two are yet unknown. With this lifetime challenge of having to be excused from the meetings Umu Nnadi for the bizarre status of bastards, one wonders how Okorocha would expect such persons with such diseases of the soul to ever reason properly. To the main issue of pleading Madumere’s case, in fact the unruly concoction was short of saying to Madumere, please come back to Okorocha’s fold and help out. The wailing is not misplaced. It is a function of their crass ignorance that power belonged to the people. The night Okorocha turned a monster; Madumere in his good nature tried everything humanly possible to bring him back to his senses. He reminded him the way of God and his songs he rendered to Him before His grace led Ndi Imo into considering him steering their affairs. Every keen person would realize that Okorocha is suffering from self-inflicted pains as tacitly presented in Okorocha’s political dirge. In his traditional impunity, Okorocha at one time would address his estranged Deputy as impeached and at some point, he would candidly present him as the Deputy Governor of Imo State. For the records, the issue was laid down to rest on September 25, 2019 at Imo State High Court, Owerri. In that historic judgment and ruling, Hon. Justice, Benjamin Iheka had declared the purported reckless removal of the Deputy Governor of Imo State, Prince Eze Madumere by Acho Ihim led ghost members of the Imo assembly as null, void and of no effect since the process fraught with serious violation of the constitutional procedure coupled with contemptuous and reckless acts of Imo parliament over an Order of the Court voiding any action until the matter before it was exhaustively determined. Meanwhile in another shameful outing, during the observation of the law week, Okorocha through his Attorney General had introduced one Ekenze Calistus as the deputy governor designate, a name not known to any law. Okorocha and his hawks received the booing and jeering of their lives. It was there and then that the Chief Judge of Imo State, Hon. Justice Paschal Nnadi addressed Okorocha cautioning him to desist from making mockery of the extant laws of the land. He was told there and then that Prince Eze Madumere remains the Deputy Governor of the State. That said, it is very incontrovertible that Okorocha was nonetheless a very crude implement when he met with the Prince who was already a trail blazer in the corporate America. Of course Madumere had pity on him and chose to sacrifice his time, resources and intellect to knock Okorocha into shape. Okorocha I knew was more of a dirty pig and even when the so called money came, people rejected him in Jos because they questioned the source of overnight money. It took Madumere’s ingenuity to cleanse him of impurities and then presented him to the people with a tool of philanthropy. 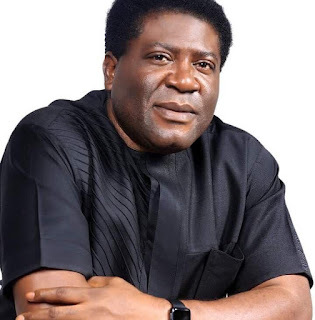 Madumere however did all these believing he was following the Christ’s ordinance of giving both morally and financially. I know Madumere is a pure breed, a Prince who knows the tradition and culture of his people and would rather not be reckless in saying all that he had to go through in trying to school Okorocha some civilities, including table manners. For this reason, I would still spare some respects for the Ogboko born shrewd politician. Surprisingly, Okorocha opened his dirty mouth to say that Madumere is a political orphan. I made bold to say it today that Rochas is a political destitute. Today he is running from pillar to post pleading with all and sundry to help him plead with INEC to give him Imo West Senatorial Certificate of Return. In all these, no right thinking Nigerian has agreed to see him let alone speak with him. The straw that broke the camel’s back was his unbelievable appearance at Senator Bola Ahmed Tinubu’s Colloquium in celebration of his 67th Birthday. Of course, as a gate crasher, he met disgrace with utmost disregard of his person to the extent he did not have a seat, a signal that he was an unwanted estranged guest. He tried finding his way around Tinubu’s daughter but got the shock of his life. Okoroch is very lonely and in severe cold even with over $3 billion Imo money allegedly fleeced. To unintelligent Okorocha, Political relevance is all about elective position even if it means killing to rule people against their will. He said that Madumere lost out in the whole political transaction. Sorry, Madumere has his set goal. It was clear and simple. Give to Owerri zone even if it was not him. He got Owerri zone Governor who has been handed down his Certificate of Return. Okorocha’s life wish of having his son-in-law become his successor has been dashed. Again, Okorocha’s hope of going to the Senate is almost at the verge losing it. Meanwhile, Okorocha’s voice at the National politics has been lost while that of Madumere has become even louder. Okorocha fought for self-serving delusional conversion of the state to personal estate but Madumere fought with the people. Today who is the greatest loser? I understand Okorocha in his lunacy also said that Madumere failed to install APC House member. It is unfortunate Mr. Nnataraonye had to find himself into such fate. Okorocha fielded House of Representatives from the same block with Nnataraonye. Going by their zoning formula, at every point in time, each block at every point has one thing as its own share politically. It happened that Mbieri where the Deputy Governor comes from had nothing in the kitty since their illustrious son, Prince Eze Madumere was not angling for any elective post, they settled for the Peoples Democratic candidate for Imo State House of Assembly. From the foregoing, it is rather the issue of equitable distribution of power that edged Nnataraonye out. Meanwhile, the winner of Mbaitoli-Ikeduru House of Representatives election, Hon. Henry Nwawuba is also from the same block with Nnataraonye. Okorocha also failed woefully in Mbaitoli. Tomorrow, Nnataraonye will surely be remembered by his people. He would have been rewarded for his loyalty but it was not just politically possible based on an established sharing formula among the people of Mbaitoli. Okorocha failed to adhere to this at both state level and at his home federal constituency. This will backfire in no distant time. It simply means that Okorocha will surely go into eternal political oblivion because even his based has rejected him for his avarice and grabbing of even people’s ancestral home. In all, Okorocha has no grace to do anything good. To him, every engagement is a scam, including his relationship with his wife and daughter. The history will also remember Madumere well for saving Okorocha’s life when it mattered most. He again sacrificed his comfort from the United States to fly down to ensure that his friend did not die. I will not mention what transpired. Okorocha must be made to read this because it is for him remember how he has stupidly undone himself by sheer greed. There is no gainsaying the fact that Madumere is a critical stakeholder in Okorocha project. His equity cut across all facets of Okorocha's life and that is the reason he has not only annihilated himself politically but in all areas of life. Madumere's hard earned money in hard currency was invested, his intellect was ploughed into it and of course his time, sweat, freedom and blood were all sacrificed to make Okorocha a human being and what he later became. As a swine as we later got to find out, he certainly would stroll back to the filth. For a man as kind as this, Okorocha chose to destroy him. As his deputy, he tried all to impoverish him even the more. Why would Madumere be given paltry sum when the office has a statutory allocation for its statutory functions? As it stands today, Madumere has had the last laugh with his highly priced Integrity and good name intact. It will remain in history that Madumere is the Hero of today’s Imo and there is nothing Okorocha can do about it. Whatever God has for Madumere in the future shall surely come to pass. Nathaniel Osuoji writes from Ideato North local government area of Imo State.